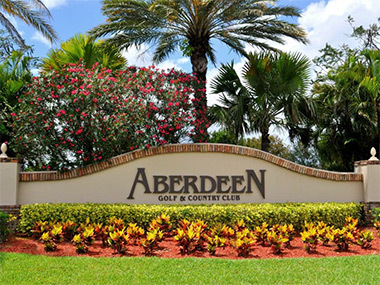 The top listing and selling Agent in Aberdeen Golf and Country Club, Sheila Aron recently completed an amazing set of transactions in Aberdeen Country Club – 4 homes sold in just 9 days. In one of the four transactions, Sheila, “The Aberdeen Country Club Go-To Agent” brought the Buyer and also represented the Seller via her strong and vast client base that encompasses all of Florida, New York and New Jersey. A resident of Aberdeen for ten years, Sheila knows Aberdeen Golf and Country Club inside and out and is a strong advocate and fan of the recent expansion and upgrades to the community including the 18,000 sq. foot fitness and aquatic center with state-of-the-art equipment, aerobics and fitness classes, indoor and outdoor café, Olympic size swimming pool, tropical waterfalls, lap pool, beach pool and Jacuzzi. This guest post was provided courtesy of Lang Realty, the leading real estate broker of Palm Beach county. Sheila works out of the Lang Realty office at 2901 Clint Moore in Boca Raton. She can be contacted at (561) 870-4949, absheil@bellsouth.net or www.aberdeencomehome.com.